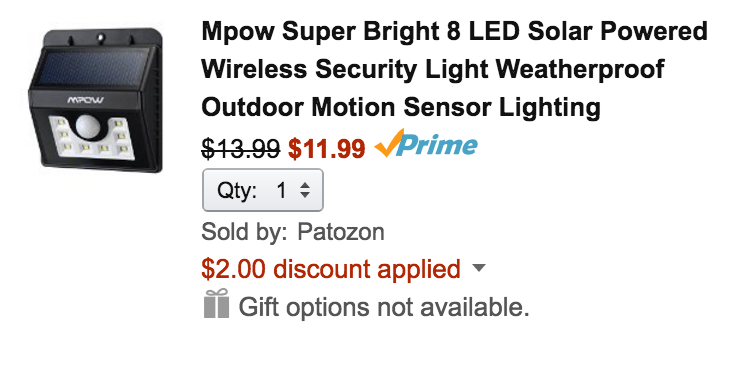 Patozon (100% positive feedback from 28,000+) via Amazon offers the Mpow 8-LED Solar Outdoor Light for $13.99. Applying coupon code XFMNHHOW drops the final price to $11.99 Prime shipped. If you buy two the price will go to $22.99 (Reg. $30) with promo code HV5Z3B9O. That’s up to $7 off the regular going rate and the best offer available. Mpow’s 8 LED Wireless Outdoor Lights are perfect for easily illuminating a path or walkway. Because it uses solar power, you won’t have to purchase batteries to keep things running. The built-in sensor can detect movement from up to 26-feet away and a waterproof design protects the light from damage. This is the #1 best-selling patio light at Amazon where it has collected a 4.5/5 star rating from over 1,100 reviewers. This Mpow light is now equipped with 8 bigger LED lights, which is far more brighter than other similar LED lights in the market. And what’s more, we increase the battery capacity from 600mAh to 800mAh, thus getting some two more hours’ duration. When received this Mpow Solar LED Light, you will find distinct difference compared to its previous version or similar lights in the market, We update the PIR motion sensor and ray sensor, so it becomes more powerful that it can detect people within 26 feet! Here you'll find all of our top Green Deals, this is the landing page for price drops on LED light bulbs, solar panels, rechargeable batteries and more. Shop top brands like Philips, WORX, CREE, Eco Smart and others. This is the place to start saving money around your home while also conserving energy and protecting our planet.